Lyme disease is an infectious disease. 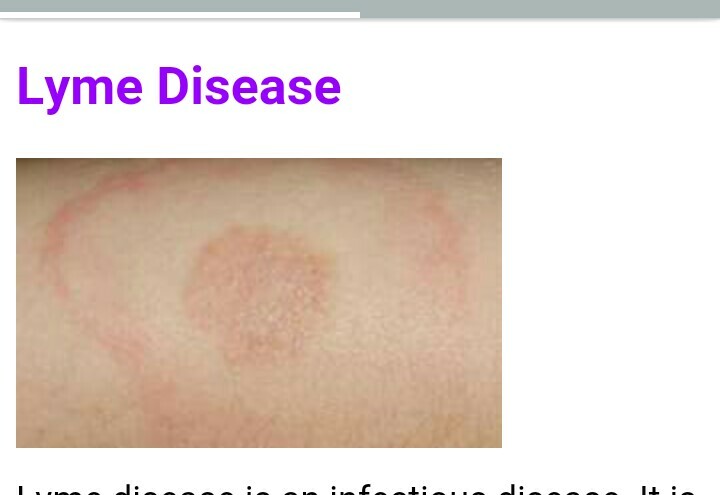 It is caused by the bacteria Borrelia burgdorferi sensu lato. B. burgdorferi is transmitted to humans via a tick bite from an infected black-legged or deer tick. The tick becomes infected after feeding on infected deer or mice. A tick has to be present on the skin for 24 to 48 hours to transmit the infection. Most people with Lyme disease have no memory of a tick bite. Lyme disease occurs in three stages: early localized, early disseminated, and late disseminated. Symptoms depend on which stage the disease is in. Symptoms of Lyme disease start one to two weeks after the tick bite. One of the earliest signs is a “bull’s eye” rash. This is a sign that bacteria are multiplying in the blood stream. The rash occurs at the site of the tick bite as a central red spot surrounded by a clear spot with an area of redness at the edge. It may be warm to touch, but isn’t painful and doesn’t itch. This rash will disappear after four weeks. The formal name for this rash is erythema migrans. Erythema migrans is said to be characteristic of Lyme disease. However, many people don’t have this symptom. Some people have a rash that is solid red. On people with dark complexions, the rash may resemble a bruise. There is a general feeling of not being well in stage 2. A rash may appear in areas other than the tick bite. Neurological signs such as numbness, tingling, and Bell’s palsy can also occur. This stage of Lyme disease can be complicated by meningitis and cardiac conduction disturbances. The symptoms of stages 1 and 2 can overlap. Persistent Lyme disease is treated with intravenous antibiotics for a period of 14 to 21 days. That eliminates infection. However, improvement of symptoms occurs more slowly. It’s unknown why symptoms like joint pain continue after the bacteria have been destroyed. Some doctors believe that persistent symptoms occur in people who are prone to autoimmune disease.